After nine years of “it’s going to happen” one of my players who got me back into WFRP all those years ago started his own campaign. And we get to play knights! In Bretonnia! We created the character (naturally taking the advantage of the magnificent Expanded Character Module by Dave Graffam) and discussed a little about what’s to come. The GM asked us all to write a little something about our characters’ background and I set out to work. I haven’t actually read the Knights of the Grail in almost ten years. I might have leafed through it on an occasion but now I wanted to get the facts right with my Knight Errant from Parravon. Aaand naturally this was where the problems started. Knights of the Empire start their careers following after some other knight, acting as nothing more than a servant. What else would you expect from a nation who has forgotten the true meaning of chivalry, the true meaning of honour, and the true meaning of courage? 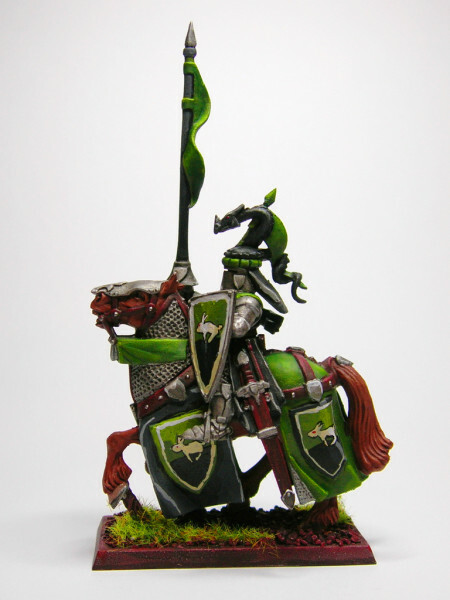 In Bretonnia, knights start off riding their own trail, as they set off on their errantry tour. Bretonnian knights learn from the best school there is: genuine experience. At the start of their tour, they don’t have any genuine experience, but most make up the deficit with their enthusiasm. As it turns out our GM had different plans and he was a bit shocked by this. Even though he has been reading stuff about Bretonnia on and off for all those nine years. “That makes absolutely no sense!” was the summary of his words. On the other hand I have to (naturally agree) but on the other hand it got me thinking the pure ingenuity of this kind of behaviour. Warning – This post contains some spoilers and racial doctrine about the evolution of Bretonnians. You can blame the fairies for that. You might know the guy from doing the art for the One Ring rpg and several other products. Best artist in the scene currently (by my opinion). By far. If you are not following what he is doing, I guess you really are not that much into rpg art anyway. After almost two years since our last campaign with WFRP was buried in silence for the lack of interest I have found myself toying about starting a new campaign with new players. The the past year and a half I have been writing Eldritch Sigils and have not paid a lot of thought to Warhammer. And still I find myself visiting the StS and FFG forum almost daily. I haven’t been quite active but I have been there. Lurking in the shadows sot to speak. As the summer draws more near starting a new campaign sounds more and more right. We have just begun a new fantasy campaign with Sigils and I hope it will be great. But as the system of Eldritch Sigils has more to do with narrating the outcomes and completing stories I think I need a counter balance with more complicated fighting and books you can browse through. While being sick put my creative time to halt I found myself browsing the statistics of the Daily Empire today. I was quite impressed to notice that “daily empire” had been searched for over 500 times in the passing year. Given that I’ve been trying to give out the link whenever possible that is quite a substantial number of searches. Thanks for that! I was also intrigued by the fact that after “daily empire” and all its variations what was most common term to find this site was “warhammer steampunk” (and its variations). I’ve posted only one post about this kind of thing. At least if my memory serves me. I would have thought that the one-sheets or The Cult of the Possessed would have got more hits but looks like you want your blackpowder and flying hot-air balloons with a little pinch of mechanical horses and steamengines! Now personally I’m not a big fan of the whole steampunk genre but I must admit I’ve used it in our games too. As for what pages have been visited since the Daily Empire was opened other than the main page (9,671 hits!) one-sheets, adventure seeds and the Cult come in with flying colors. It is a bit funny though that even though this site is supposed to be an “inspirational site” and was started to host the list for warhammerish movies these pages have fever hits than the steampunk post. All in all I guess you want a little more steampunk right? Then I suggest you to give comments or send me mail as I’ll begin the work on the finale of the Master of Shadows-campaign at January 2013. While writing a new adventure I stopped to think about how to name it. The usual way of “The something something” is used so many times that it looks even a bit silly. I got a bit carried away while thinking about this and thought of Barbarians of Lemuria by Beyond Belief Games. It is an excellent game and I can recommend it to everyone. Butchering hordes of minions has never been so fun! In Barbarians of Lemuria all adventures are named after one of the characters (usually determined randomly). So it is Gotrek the Gladiator or Felix and The Curse of the Onyx Sword etc. It is a good way to shine some light on characters. This got me thinking. Why wouldn’t use it in other fantasy games? After an adventure is over the GM could reveal the name of the adventure (I never reveal names before the end as they are usually too much of a give-away). Then the players could decide which character made the adventure most memorable. Giving the decision to the hands of the players is a great way to reward them for good roleplaying and allow them to think how they could make sure that the next adventure would carry the name of their character. Just a thought though. At least I would like to remember the adventure as “Jacén de’Caradué and the Crimson Rain” or “Nils Bärherz and the Eye for an Eye”.